There's no getting away from it, this is the graphics card we've been waiting for since we first heard about Nvidia's Kepler GPU architecture. The GTX 780 Ti is simply the most powerful graphics card on the planet right now and the first to sport the real full-fat GK 110 graphics processor. When it unleashed the impressively efficient GK 104 chip, with the GTX 680 as the vanguard, we had our suspicions it wasn't the full fat Kepler chip Nvidia had been working on. And so when we heard about the Tesla K20 and K20X professional cards, with their massive GK 110 GPUs and frighteningly-fast floating point performance, inevitably we wanted one. But time, she passed, and there was no talk of the top Kepler chip ever making its way down into our gaming PCs. And we were sad. Luckily for us AMD pulled its finger out and delivered the HD 7970 GHz update and gave the GTX 680 a wee shoeing in the benchmarks. Nvidia had to hit back, and whether or not the GK 110 chip was ever meant to be dropped into a gaming card, it decided to bring its big guns to bear upon AMD's top graphics card. The GTX Titan then was Nvidia's shock-and-awe response to reclaim the single-GPU performance crown. It used the same GK 110 GPU Nvidia had reserved for its pro range, opting for the Tesla's 2,688 core behemoth in order to drop the mother of all benchmarking bombs on AMD's top card. It wasn't just the performance of the Titan though that singled it out against the competition. Despite the massive 533m2 slice of silicon it still managed to run relatively cool and very quiet – this was mostly down to the beautiful chrome-plated cooler Nvidia pimped its top card out with. As well as giving the Titan an immediately recognisable and desirable design it also provided a much better user experience than the admittedly quicker GTX 690 and later the HD 7990 dual-GPU cards. But the GK 110 GPU the Titan was sporting still wasn't representative of the full power of the Kepler architecture. The graphics processor at the heart of both the Tesla K20X and the GTX Titan contained 2,688 CUDA cores spread across fourteen SMX modules, but the full GK 110 GPU was designed to house fifteen of those Kepler streaming microprocessors with 192 CUDA cores in each. Doing the mathematics that meant there should be a chip around with all 2,880 CUDA cores which would be capable of throwing around polygons at breakneck speeds. As ever though yields were a problem. Nvidia could make the full fat chips, but not in any commercially achievable numbers when it first started manufacturing the Kepler graphics processors. The decision was taken to go with just 14 SMX modules in exchange for being able to produce lots of the beefy 28nm processors. But history has a tendency, despite our best efforts, of repeating itself and as AMD suddenly reclaimed the performance lead in the single-GPU graphics game Nvidia has responded with the full weight of its Kepler architecture. The GTX 780 Ti then comes with 2,880 of those CUDA cores in that fifteen SMX configuration. Fingers crossed, now the production process is more mature, the yields on these top chips are much improved. If not we'll either see very few of these impressively powerful cards in the wild, or Nvidia is taking a massive hit on each one just to be able to say it's got the fastest single-GPU card in the world. The GTX 780 Ti is a hugely desirable card. When you just take the GTX 780 Ti at stock speeds it can claim the top performance crown overall, but just not by much. At those speeds it doesn't look like the extra money you're spending makes much difference at all. When you overclock though the top-end GK 110 chip really stretches its legs. At stock speeds the performance lead isn't really that great compared with the R9 290X and even the straight R9 290. Indeed, in the Company of Heroes 2 test the second-tier Hawaii card beats this GPU behemoth. Elsewhere though it's generally only a few FPS on average quicker than the top AMD card. Considering the GTX 780 Ti is another £100/$160-odd more expensive the stock performance makes it hard to argue for the Nvidia card, despite for the most part being the faster GPU. So we were a little underwhelmed by the GTX 780 Ti's performance. But not surprised. 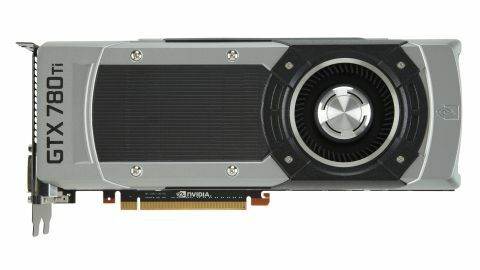 We kind of expected Nvidia to ensure it was a quicker card than the R9 290X, otherwise there really would be no point in releasing a more expensive option. The GTX 780 Ti then is a great example of a card being released for the sake of claiming overall top-end superiority, but not as something any real person would actually buy. Well, it would be were it not for the stellar overclocking performance. Normally we're not ones for leaning review scores so heavily on overclocking performance, particularly as it can vary so much from chip-to-chip. But the GPUs in these cards represent the pinnacle of graphics excellence and Nvidia has been keen to encourage folk to get creative with the clocks. Traditionally when it comes to homebrew or factory-spec overclocking 10% is about the best you can hope for when it comes to performance boosts. The GTX 780 Ti sample I've got hits a minimum of 16%, sometimes going over 22%. That's a really hefty frame rate boost, and puts it generally comfortably ahead of the AMD competition. And even when you're really pushing the clocks it /still/ only hits 83ºC and with the Titan-esque cooler running at 67% we reckon it's only as noisey as the 290X. Even with the serious overclocking headroom this iteration of the GK 110 chip seemingly enjoys that still doesn't give the GTX 780 Ti the 'must-have' performance of the superb Radeon R9 290 (minus the 'X'). That price / performance power of the second-tier Hawaii card still keeps it at the top of our graphics card shopping list, but the new GeForce card is still a mighty desirable thing. Desirability is something the Radeon cards, with their toy-town plastic shrouds and noisy fans, just don't have. They may be quick and fantastic value, but where the vast majority of gamers were desperate to get their mitts on a Titan they'll now be after a GTX 780 Ti. Those people wont have changed their targets to either of the more-affordable, but almost-as-quick Radeons.